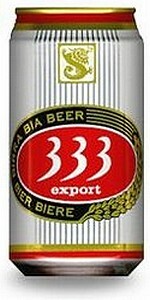 333, or “Ba Ba Ba” as it is known in Vietnam (ba means three in Vietnamese) has managed to endure over a century of regional conflict and turmoil to become one of Vietnam's most popular beers. First produced in 1893 by France's Brasseries et Glacieres Internationales, 333 has continued to be produced from original German ingredients and best German technology. This beer gained popularity as Beer 33, at the turn of the century referring to the 33 cl can size. '33' called "Ba Moui Ba"(thirty-three) by the Vietnamese, was popular among American soldiers who referred to it as "Bomb-De Bomb" and drank it with ice. The brand was nationalized with the fall of South Vietnam and the brand was changed to '333' to reflect the change to millilitres as the standard measurement. Today, 333 is brewed by the country’s largest brewer Sabeco which boasts of having a beer taster who samples each batch to make sure it meets the company’s highest standards; I may have to apply for this job. The beer pours pale yellow with a foamy white head and has weak flavours typical of an Asian rice-adjunct lager. A bit of grassy hop flavour and a lot of carbonation make this watery beer a refreshing beverage if not much else. On second thought, maybe I'll rethink their beer-taster position... If you're in Vietnam, don't be shocked if the beer you ordered comes with a big chunk of ice in it, hell, it beats drinking it warm. "Mot, Hai, Ba, Yo!" (1, 2, 3, Yo(?)!) Cheers.